Hope you are all well! Today I am lucky enough to be discussing with you my experience with one of my favourite brands. 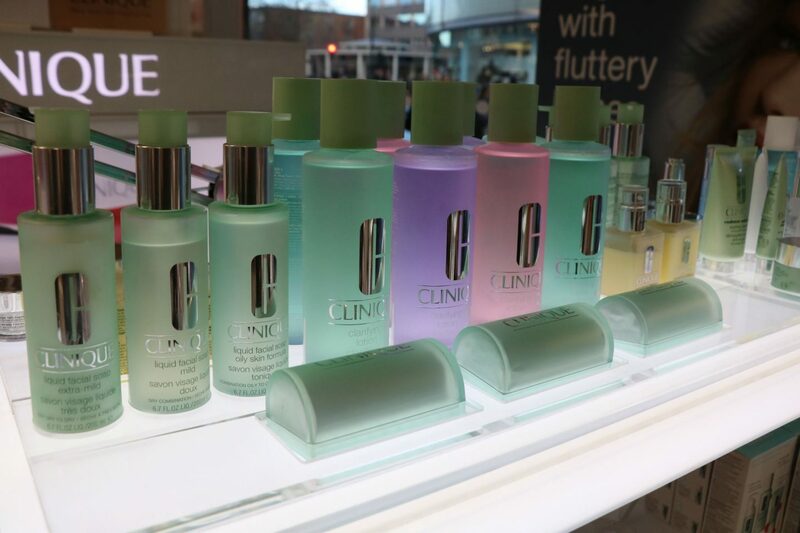 I have always loved Clinique and how good all their products are for your skin. They have something for every single girl regardless of your skin type or colour. I have always been able to find products that are perfectly tailored to all of my features and which help to make my skin feel refreshed and renewed. 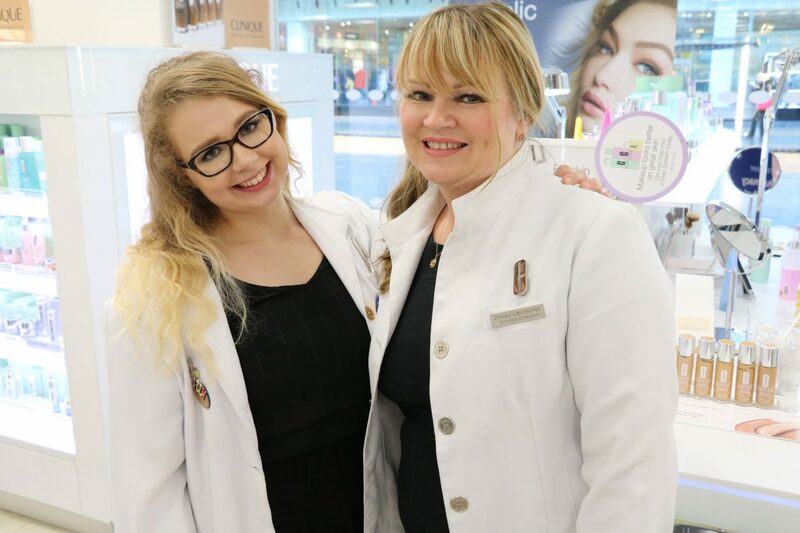 Recently, I was invited to have a skin consultation at the Clinique counter at my local Boots in Exeter. I found out so many things about my skin that I wouldn’t have been able to find out elsewhere. I was also introduced to new products that were ideal for my skin type and would be helpful at addressing the problems I have with my skin. I spend my time between 3 countries and I always find that when I have been travelling between them I can easily break out due to changes in climate. I also tend to spend a lot of my time flying and this adds to the problem of dry skin and spots. Therefore this consultation was so helpful as I gained some really good tips and tricks on how to keep my skin hydrated and prevent breakouts as much as possible. If you are having any problems with your skin, have any questions or even just want to find out your skin type then I would definitely recommend having a consultation with Clinique. The staff are so knowledgable and lovely which makes the experience that much more enjoyable. 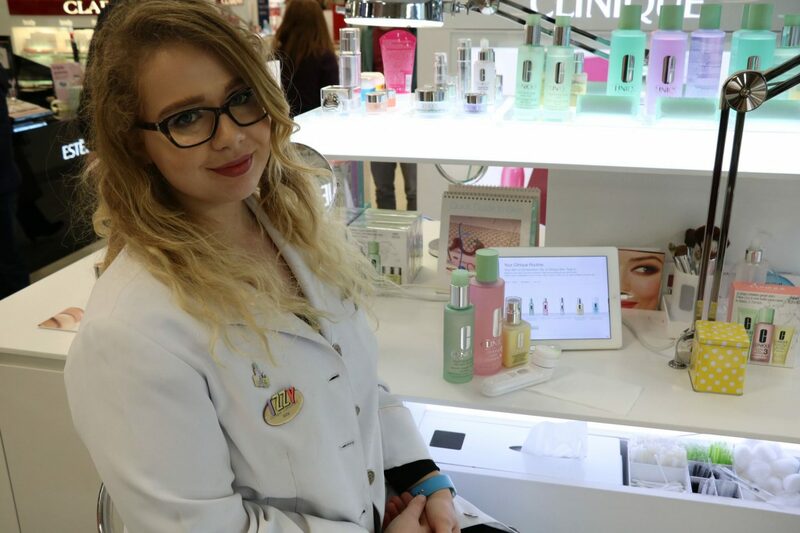 If you are wondering what happens during a consultation then I will be giving you an overview below so you can know what to expect when you are heading to your local Clinique counter. I was firstly met by the lovely Izzy who outlined what she would be helping me with that day. Izzy was so good at giving me simple tips & tricks that I could easily implement into my daily skincare routine which I know are really going to make a difference in the appearance of my skin. We began by doing a Skin Diagnostic on an iPad which involved being asked questions on my skin’s health, my concerns, and environmental factors such as what kind of area I live in (e.g suburban). These questions were then used to quickly help Clinique to categorise my skin type. My skin type came out as being Skin Type 3 (combination skin – to slight oiliness in the t-zone) and comfortable cheeks, that feel soft to the touch. This then lead Clinique to recommending a skincare routine with products that work well with my skin type. I was recommended the “3-Step” routine in Skin Type 3 which involves using cleaners that are ideal for those with skin prone to oiliness and should be used twice a day. I think one of the greatest skin tips I have personally learnt is to wash & clean your face twice a day – in the morning and in the evening. I definitely believe you need to get rid of sweat & dirt that has accumulated during the night as well as getting rid of all the makeup & other dirt that has built up over the course of the day. Izzy used a sonic brush on my skin for 30 seconds to help give a deeper cleanse. The thing I love about the sonic brush is that it’s waterproof, so can be used in the shower and saves loads of time. I know I’m the kind of person who is always trying to find little tricks that mean I don’t have to spend as much time getting ready in the mornings. Once the soap was washed off the face, Izzy added a clarifying lotion which helps to exfoliate the skin and promote a healthy skin turnover as well as sweep away any dry skin cells. We were discussing how we both love this stage as it feels so refreshing and cooling on the skin. 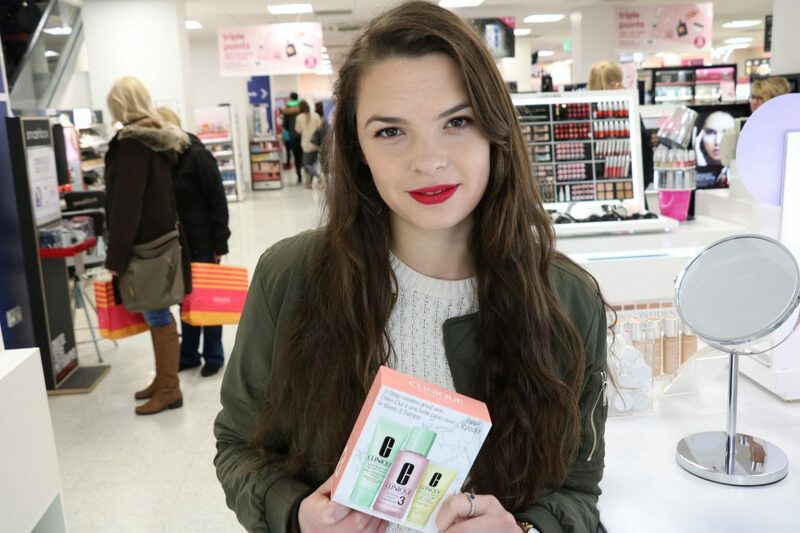 Then Izzy added some of Clinique’s Dramatically Different Gel. This stage helps to restore a natural moisture barrier to the skin and is apparently a huge favourite amongst Clinique customers. I was then colour-matched to find my perfect foundation colour. This is something that I definitely recommend getting done. I would say one of the biggest problems I see girls struggling with is picking the right foundation colour. In this case Clinique does all the work for you and will mean you never have to worry about looking the wrong shade. Izzy used the Super Balanced Silk foundation which is a newer foundation that contains SPF and was just been released last summer. It feels so smooth on your skin and doesn’t feel like your pores are getting at all clogged with it – a common problem I face with most foundations. Izzy described it as acting like a “second skin” which I think perfectly sums up how this product feels. Izzy then added some sun blushed bronzer and some pep-start eye cream. The eye cream is honestly amazing as it works as a great quick fix to moisturise your eyes – especially good for millennials who aren’t getting enough sleep! I then had some All About Eyes Concealer added which helped to brighten under my eyes and cover up any visible imperfections. Izzy then completed the look by adding some High Impact Mascara and a thin line of Pretty Easy Liquid Eyeliner which helped to give that subtle Valentine’s Day look. It was all finished off by enhancing my brows using the Instant Lift brow product in the shade Deep Brow. The makeup and skin honestly looked amazing afterwards. It ended up looking effortless & natural and you couldn’t even tell that I was wearing much makeup. I would totally recommend to all of you girls to spend 20-30 minutes at an Clinique counter when you next have some free time. I learnt so many helpful things about my skin and left with some tips & tricks that I know are going to be super helpful to me. Clinique is really good at making you feel special by finding products that suit your unique skin type. I will make sure to keep you all updated on their brand and give you some reviews on my favourite products once I have tried out the samples I was given. In the meantime I hope you enjoy some of the photos of my day and let me know if you have any questions! Sending you all lots of love!! 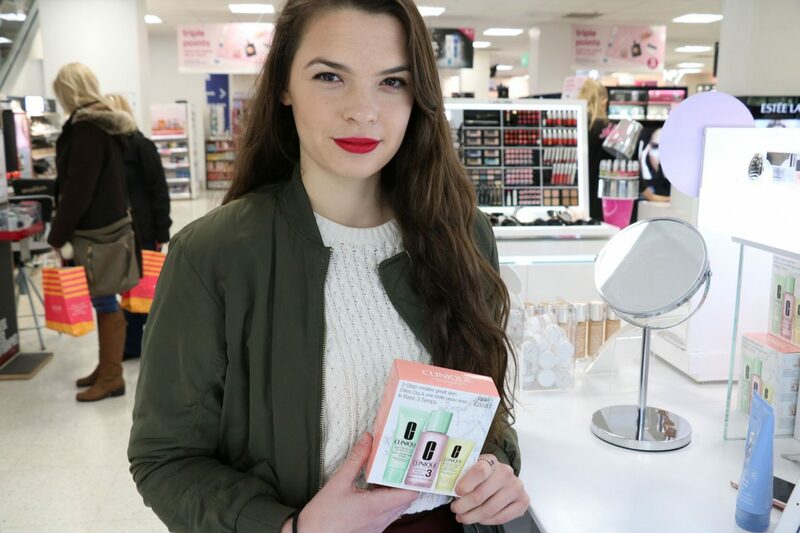 At the Clinique counter in Boots! Izzy was so helpful and bubbly throughout the whole consultation. 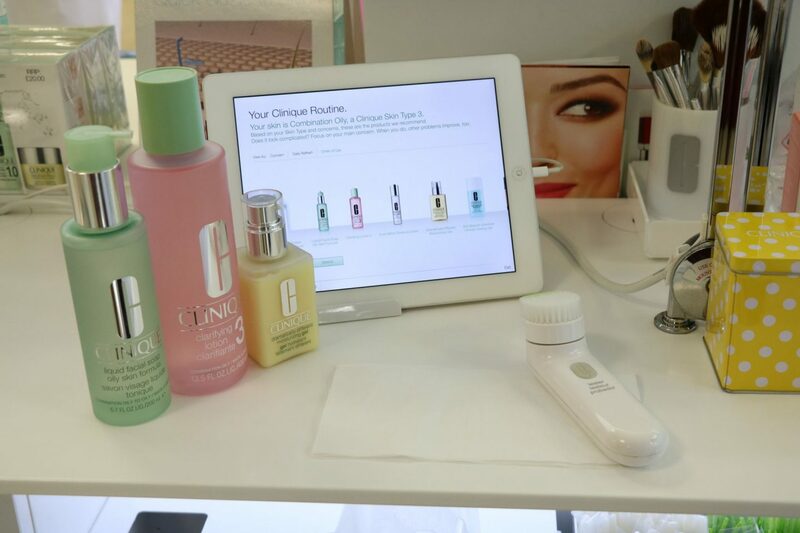 Some of Clinique’s amazing products on display. 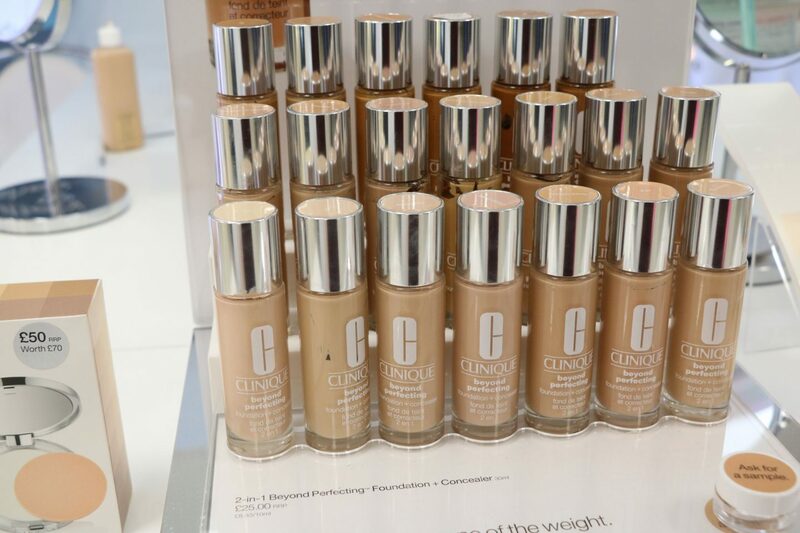 I love how wide their range of foundations as it means they will always be able to find the perfect colour for everyone. 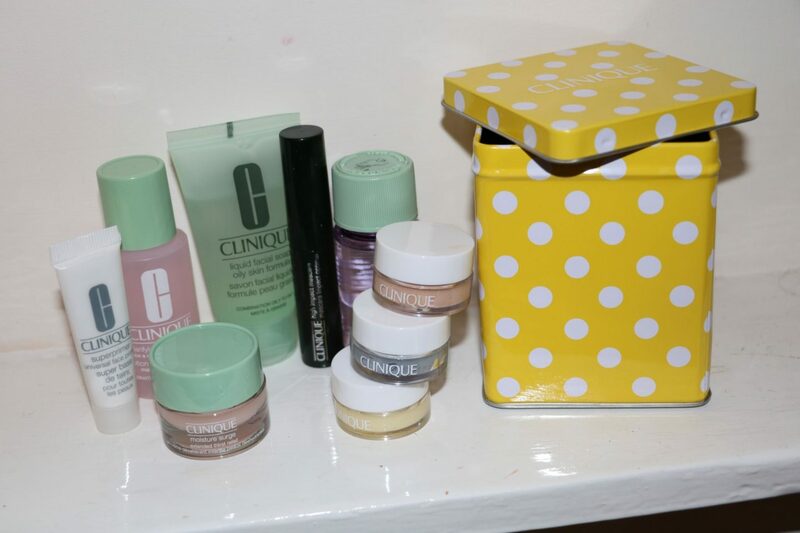 Some of the goodies I was given from Clinique! Everyone at Clinique is so helpful!